Lauren Smyth (Ospreys); Jasmine Joyce (Scarlets), Alecs Donovan (Ospreys), Kerin Lake (Ospreys), Jess Kavanagh (RGC); Robyn Wilkins (Blues), Keira Bevan(Ospreys) ; Caryl Thomas (Dragons), Carys Phillips (captain, Ospreys), Amy Evans (Ospreys), Siwan Lillicrap (Ospreys), Mel Clay (Ospreys), Alisha Butchers (Scarlets), Bethan Lewis (Dragons), Sioned Harries (Scarlets). Replacements: Kelsey Jones (Ospreys), Cara Hope (Ospreys), Cerys Hale (Dragons), Natalia John (Ospreys), Manon Johnes (Blues), Ffion Lewis (Scarlets), Alicia McComish (Dragons), Lisa Neumann (RGC). johnbirch wrote: I am left wondering if the DRV would have forgotten to apply for test status for one of their men's games. The women are, by their own choice, organized in the DRF (Deutsche Rugby-Frauen) a single entitiy within the DRV. So without knowing any details, that's where to look first for the mistake not the DRV itself who organizes the men's matches. Minor point - because I do not know - but if DRF is only a section within DRV, then surely its still DRV who should be applying for test status as they are the recognised national union? DRF cannot go over their heads to World Rugby? Admittedly it may be that DRF did not ask DRV to apply for the status. I don't think World Rugby recognizes women's only federations anymore. TheStroBro wrote: I don't think World Rugby recognizes women's only federations anymore. I think Samoa has a separate women's federation still? But it would be the only one. I think. johnbirch wrote: Admittedly it may be that DRF did not ask DRV to apply for the status. Still only speculating, but that's where most likely the test status got lost. The DRF head is always also a Vice-president of the DRV, so whatever she says, she is de facto representing the DRV. I was just pointing out the organization-difference between a men's game and a women's game. While the mistake definitely lies in the DRV (if there actually was a mistake, this could have not apply willingly), it has nothing to do with how a men's test match gets recognized as different sections within the DRV organize those different games. So if there is a mistake, the fault lies within the women's section not because the DRV doesn't care about women's rugby. John...how do I watch tomorrow's game ? TheStroBro wrote: John...how do I watch tomorrow's game ? France v New Zealand will be free-to-air in France on France 4. That will be geoblocked but if you can set up a VPN you should be able to view it fairly easily. The England game is on Sky in the UK, which is not free-to-air so even a VPN will not help. I do not know if it will be available outside the UK. The England game is supposedly on FLO...but yeah. How do we watch the France-NZ match? France v NZ 0-0 ! TheStroBro wrote: How do we watch the France-NZ match? So, got the second half of ENG v. USA...brutal. Worst defeat to England ever, with most points conceded ever to England. England had 6 on debut...crazy. Watched the last 20 of FRA-NZ...intense. Wales Women kicked off their autumn campaign with a convincing 19-5 victory over South Africa at the Arms Park. Rowland Phillips' side crossed for three tries in total with Jasmine Joyce, Sioned Harries and Carys Phillips all crossing while Robyn Wilkins kicked four points. All South Africa could muster was one try courtesy of Lusanda Dumke. Wales set the tone in the early stages of the match with their scrum demolishing the South African eight. The home sides forward set the platform for their first try with the likes of Carys Phillips and Sioned Harries making the hard yards. With the South African defence on the back-foot Wales moved the ball wide with some slick handling from Robyn Wilkins and Alecs Donnovan putting Joyce over at the corner. The visitors enjoyed a period of possession and began to exert their physicality but the Wales defence stood firm. Wales began to turn the screw just before the interval with their pack pushing hard on the South African line. After a couple of powerful carries the ball was spread wide with visiting centre Demi Nel putting in a try saving tackle on her opposite number Donnovan. But Wales continued to go forward and right wing Nosiphiwo Goda was sent to the sin bin for killing the ball on the floor. Wales opted to take a quickly tapped penalty with tight-head prop Amy Evans charging over the line only to be held up. But Phillips' side shunted South Africa backwards in the proceeding scrum with powerful No 8 Harries dragging three defenders with her over the line to extend Wales' lead. Wilkins successfully converted meaning the home side turned around 12-0 to the good at half-time. Wales kept up the pressure in the early stages of the second half and came agonisingly close to their third try only for second-row Mel Clay to spill the ball forward with the try line at her mercy. South Africa finally won some ball and were able to exert some pressure on the Wales line. After a period of trying to wear their hosts down with some strong carrying No 8 Aeza Hele crossed at the corner. But the try was ruled out for a forward pass from outside half Zintle Mpupha. South Africa continued to apply intense pressure on the Wales line resulting in Harries being sent to the sin bin for illegally slowing down the ball. The Welsh ladies' defence was tremendous as wave after wave of South African strike runners came their way. But the South Africans eventually turned pressure into points when blindside flanker Dumke sneaked over from short range. South Africa's try served as a wake-up call for the hosts who began to build some pressure of their own. There was a 10 minute break in play after Wales star Kerin Lake was stretchered from the field after a collision of heads. But Wales sealed the win when captain Phillips crossed from short range after a powerful driving lineout by the hosts. I was wondering if there are any places to watch or download the Women's game between Wales and South Africa from yesterday's game. I imagine next year they will make us play Hong Kong again. 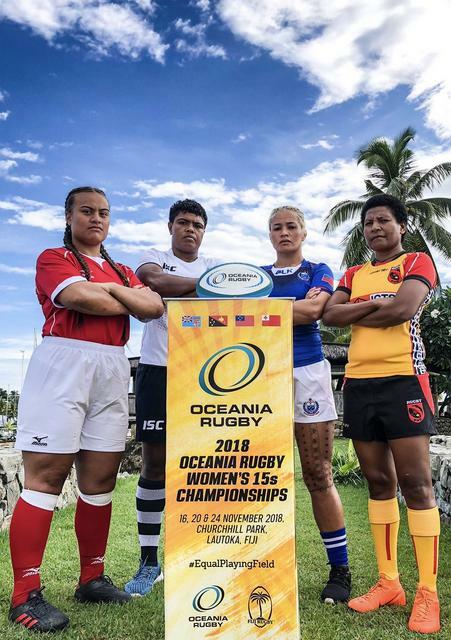 Oceania Womens XVs Rugby Championship this coming weekend. It's not an international, but the Netherlands are playing the French military on Saturday 17th. And now a big smile for the camera!